Building a Community – The Surprising Stories of Durham Presbyterians…. Durham often gets a bad rap. Other than Duke University, the Duke and VA hospitals, and the Durham Bulls, what is there to bring anyone to this post-Civil War city? And isn’t Presbyterian history all about the brave Scots or Scotch-Irish or even Waldensians coming to the New World and bringing their religion with them? Or founding schools, colleges, and literary societies in antebellum North Carolina? It certainly is that, in part. But just as interesting and sometimes more surprising are the stories of their descendants who found themselves faced with equally great challenges in the later 19th century and throughout the 20th century. First Presbyterian Church of Durham is the perfect example of this, and Dr. Peter Fish of Duke University, the church historian, will tell us about it. Durham came into being almost overnight as an industrial city. The soldiers in Sherman’s army, camped near Bennett Place at the end of the Civil War, discovered the brightleaf tobacco of John Ruffin Green and ordered more of it after they returned home. Green and W.T. Blackwell soon formed the Bull Durham Tobacco Company, and in 1874 Washington Duke moved his operations into Durham as well. The town was incorporated in 1869. When the First Presbyterian Church was organized on the last day of 1871, the town was full of tobacco warehouses and factories, a growing number of textile mills in East and West Durham, a few well-to-do families, and a great many black and white workers. The first frame church was built on the present downtown site, Roxboro and Main, in 1875. A larger brick building replaced it in 1890. Thanks to the generosity of tobacco and textile magnate George Watts, a Sunday School was added in 1913, the present sanctuary in 1916, and Church House in 1923. As outreach to the communities of mill workers housed next to the giant textile mills, First Presbyterian began Sunday Schools at Erwin Mills in West Durham and in the Edgemont community in East Durham in 1892, and a mission at the Pearl Cotton Mill in 1894. 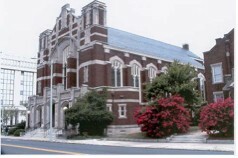 These became Blacknall Memorial Presbyterian Church, Fuller Memorial (now A.R.P. ), and Trinity Ave. Presbyterian Church. Their first church-sponsored foreign mission was planted in 1895 in central Brazil, followed by one in Korea and others in Africa and Cuba. In the 1920s and 30s, there were lively discussions about temperance and biological evolution, but during the Great Depression the church struggled with the more immediate needs of the congregation and the community, including a major strike in textile mills across the South (1934). Then came World War II. Camp Butner was built 14 miles north of Durham as an army training facility, and homesick young soldiers began to flood into Durham. The whole congregation at First Church, led by their new minister Rev. Kelsey Regen and the church hostess Clara Matthis, turned the church into a home away from home for the newly enlisted men and their officers—while careful to keep them separate! When Butner became a major redeployment center in 1943 with a huge army hospital, the congregation was welcoming more veterans and those recovering from wounds to the body, mind, and spirit. One of our officers, Mrs. Ann Myhre, is the niece of Dr, Regen and will share wonderful pictures and stories of this era as well as the next. The important roles of women and African-Americans during the war led them to seek increased respect and responsibility in the years that followed. First Presbyterian Church of Durham was a leader in their recognition. In 1954, the session of First Presbyterian overtured Granville Presbytery to endorse ordination and installation of women as elders and deacons. 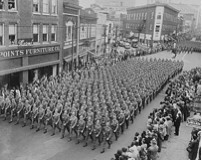 The struggle in Durham over African-American civil rights had begun in the 1930s but intensified during WWII when the presence of black GIs led to discrimination and violence against them. A bi-racial committee of ministers was formed in 1944 to improve racial cooperation. In 1955, only one year after Brown v. the Board of Education, First Presbyterian voted to seat all who sought to worship, while at the same time continuing its traditional support for Presbyterianism in the city’s African-American community. Throughout this period, Dr. Regen and his congregation publicly supported equal rights and were sometimes vilified as a result. Less controversially, in 1950 he and Dr. William Bennett of Trinity Avenue revived the Presbyterian student group at Duke University, and eventually persuaded Synod to fund it. Suburbanization in the 1950s and 60s led many churches to move, but First decided to stay “Downtown by history and by choice.” They built a new Christian Education building in 1964 and have since then developed the Presbyterian Urban Ministry, based at the church. The Day School, founded in 1970, seeks to provide a high quality of care to a diverse group of children. St. Joseph’s A.M.E. (1869) and White Rock Baptist (1873) were central to the community. Yet in the 1960s, 200 acres in the heart of Hayti, including White Rock Baptist Church, were knocked down to make way for the Freeway. It took a major effort by the whole community to save St. Joseph’s. It is now the Hayti Heritage Center, including performance space, a dance studio, an art gallery, classrooms, and rooms for private events. We will have a tour of this beautifully renovated building after lunch on October 16. The Duke Homestead and Tobacco Museum (Take Roxboro Rd. north to I-85/Hwy 70. Go west to Exit 175, Guess Rd., and follow the signs.). 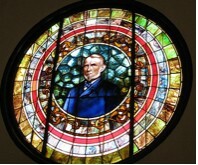 Why is a stained glass portrait of Washington Duke in a window at the Hayti Heritage Center? Washington Duke was born in 1820 and grew up as the eighth of ten children on a farm in what was then Orange County. He left home at 21 to become a tenant farmer, but eventually accumulated 300 acres. He disapproved of slavery and owned only one slave, a house-keeper, but did rent the labor of neighboring slaves as needed. By 1858 both his first and second wife and one son had died early, leaving him with four children to raise. Although a Unionist, the conscription acts forced him to join the Confederate Navy at the end of 1863. He began to grow tobacco about 1859, but, aware of the growing popularity of manufactured brightleaf smoking tobacco, he sold or leased his farm before going to war, requiring payments to be made in tobacco and stored at his homeplace. Captured during the war, he was released in New Bern and walked home – 135 miles. He regained his land, and in a small log building began to manufacture a smoking tobacco called "Pro Bono Publico.” In 1874, W. Duke and Sons built a new factory in Durham, and in 1884 the Dukes were the first to use a cigarette-rolling machine to replace the slow hand-rolling process. Their fortunes were made. Washington Duke had no formal education. His son, James B. Duke, once remarked: "My old daddy always said that if he amounted to anything in life it was due to the Methodist circuit riders who frequently visited his home and whose preaching and counsel brought out the best that was in him." In turn he donated to Methodist causes, including construction of new buildings for the Methodist and African Methodist Episcopal churches in Durham – in 1891 helping the black community build St. Joseph’s as a beautiful and elegant church. Trinity College, a Methodist institution in Randolph Co. moved to Durham in 1892, with help from Washington Duke and Julian S. Carr, another Methodist tobacco magnate. In 1896 Duke gave Trinity an endowment of $100,000 with the stipulation that the college "open its doors to women, placing them on an equal footing with men." He died in 1905. His son, James B. Duke, gave in 1924 a very large endowment, for which the college was renamed. As stern as Washington Duke looks in the window portrait, it is perhaps his stern sense of fairness that still lights the Hayti Heritage Center. Martha McLeod, a life member and former president of NCPHS, was honored May 9, 2010 at Bethesda Presbyterian Church in Aberdeen. The congregation dedicated a new pulpit Bible (New Revised Standard Version) in Martha's honor. Martha was Director of Christian Education for many years and was the congregation's first woman elder. She has held many other positions. The previous pulpit Bible was given by Martha in honor of her mother, Sarah Cranor McLeod (Mrs. John D. McLeod, Sr.). This McLeod family has called Bethesda Church home for most of the congregation's 222 years. Bill and Wilma Ratchford Craig, longtime members and former officeholders of our society, were signally honored at a celebration hosted by the Gaston County Historical and Art Museum on May 22. The Craigs were cited for a “lifetime of dedicated service” to Gaston County’s rich history, especially in historical preservation. Also noted in the citation were Bill and Wilma’s activities in promoting and protecting the environment, their prominent roles in the agricultural life of Gaston County, and their service to history and the community generally. The museum was born on July 4, 1976, and Bill chaired the committee that brought it into being. Since then they have devoted both time and treasure to helping ensure that the museum was an institution of which Gaston County could be proud. A visit to the museum’s website—better yet to the museum itself—shows that this has been well accomplished. The Craigs are both descended from early Scotch-Irish Presbyterian settlers, and their abiding faith has led them to be active in church affairs for many years. The award recognized this in stressing their steadfastness in a commitment to doing what is right, their dedication to truth, their teamwork in working with others, and their appreciation to God for his gift to them of the love of nature, history, and community. To which all who know the Craigs will add a resounding “Amen!”. William "Bill" Randall of Lillington, NC has died. He is survived by wife, Margaret. The Randalls have been active members of Lillington Presbyterian Church, where Bill served as elder and in other positions. Margaret has been Moderator of Presbyterian Women. The Randalls enjoyed at least one NCPHS tour of churches in recent years. Jamie D. Stimson of Statesville has died. He was a graduate of Davidson College and Union Theological Seminary, Richmond, VA. Jamie, an ordained Presbyterian minister served pastorates in North Carolina, South Carolina, Virginia, District of Columbia, and Tennessee. He was predeceased by wife Nellie Gray Sides Stimson, also a history buff and member of our society. Jamie is survived by two sons and two daughters. He was active in historical organizations in Statesville during his retirement years. Bethany Presbyterian Church, Lumberton. 134th Anniversary Souvenir Book, 1875-2009. Black Mountain Presbyterian Church, Black Mountain. A Pictorial History. 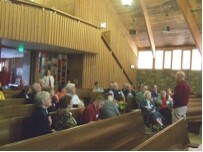 History of the Presbytery of Coastal Carolina, 1983-2007. First Presbyterian, Fayetteville. Fling Wide the Gates, by Mary Hayslip. Oakland Presbyterian Church, Clayton. Great Is Our Heritage. Our sincere congratulations to all who helped to create these! Montreat in the springtime! We visited the lovely memorial garden near the entrance gate, and then heard about the Montreat Presbyterian Church, UPUSA – a thriving church without walls. Black Mountain Presbyterian Church recently published a very fine pictorial history of the congregation. 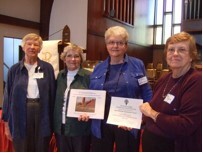 During our visit to the church, the book was recognized by an award for excellence, presented by Awards Chair Ann Myhre (right) to Florence Shelor, Hilda Hobson, and Charlotte Sprawls. Rev. Steve Runholt told us about his congregation and about his role as college chaplain at Warren Wilson Presbyterian Church in Swannanoa. College Archivist Diane Sanderson led us on a very interesting and entertaining tour of the campus, ably assisted by Ernst Laursen, former manager of the college farm. That evening, Ron Vinson of the Presbyterian Heritage Center (foreground) and other members of the Society heard about the long and fascinating history of the First Presbyterian Church of Swannanoa, formerly Piney Grove. The first day ended with an excellent dinner at Swannanoa! 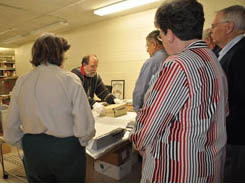 Ron Vinson giving an interesting behind-the-scenes tour of areas for document conservation and exhibit preparation at the Presbyterian Heritage Center at Montreat. 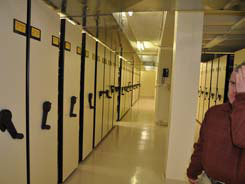 Moveable shelving at Presbyterian Heritage Center at Montreat. Pete Reary, President of the Mountain Retreat Center, explains some of the history of Montreat and their close working relationship with the Heritage Center. Rev. Richard Ray, member of the board of Directors, explains that the Center is entirely independent from the UPUSA General Assembly and relies on the support of individuals and congregations. 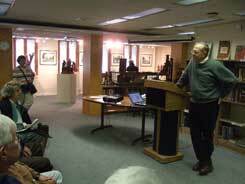 9:30 – First Presbyterian Church History and Tour – Dr. Peter Fish, Duke University. Short Tour of Downtown Durham. Please send form below and check (payable to NCPHS) by Friday, October 8, to NCPHS, P.O. Box 20804, Raleigh, NC 27619-0804. If you have questions, please call our Program Chairman Tony Brewer at 919-776-8091. Comfort Inn University at the intersection of I-40, exit 270, and US 15-501. 3508 Mt. Moriah Rd., Durham 27707. Phone: (919) 490-4949. To get to the church (6.7 miles), follow 15-501Business (Durham-Chapel Hill Blvd./University Dr.) into downtown Durham. Go under the Durham Freeway (NC 147) to Main St., turn right, and go 2 blocks to Roxboro Road. Turn left on Roxboro Rd. and park behind the church. If you have questions, please call our Program Chairman Tony Brewer at 919-776-8091. 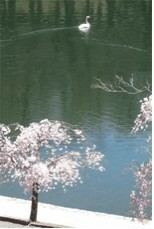 **If you have not yet paid your dues for 2010, or if you would like to join, please include them with your registration. If you will not be able to come to the meeting, just put your information on the form and send it with your check to the same address. Back dues are forgiven. Of course, you do not have to be a member to come to our meetings, but we do hope you are willing to pay the small membership fee to sustain our organization. © 2007 North Carolina Presbyterian Historical Society. All rights reserved.